This unit supports A4, A5, JIS-B5, Letter, Legal, Executive, Folio and Statement sizes. Paper (16 to 47 lb., 60 to 176 gsm), card stock, and labels may be used from this drawer. Includes 550-Sheet Tray. Paper size, paper and tray-present and tray-low sensing are supported. The optional caster base is required when the product is configured with additional drawers, the high capacity feeder or the spacer when used floor standing. Go to www.lexmark.com/multifunctionprinters for more information. The optional caster base is required when the product is configured with additional drawers, the high capacity feeder or the spacer when used floor standing. Go to www.lexmark.com/multifunctionprinters for more information. This unit supports A4, A5, JIS-B5, Letter, Legal, Executive, Folio and Statement sizes. 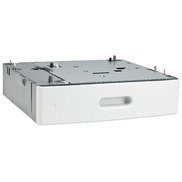 Paper (16 to 47 lb., 60 to 176 gsm), card stock, and labels may be used from this drawer. Labels, Card Stock, Plain Paper, Refer to the Card Stock & Label Guide.